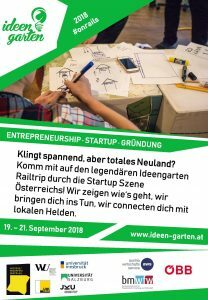 The Ideengarten (Garden of Ideas) is an interdisciplinary and interuniversity event for the promotion of entrepreneurship. In the pleasant atmosphere, the basics of entrepreneurship will be conveyed and successful young entrepreneurs will share their experience. The participants will, of course, take an active part and the embodied entrepreneurial spirit, as well as gamification, will make it more interesting. In small teams visions will be created, business models developed and business plans worked out – all of this accompanied by experienced mentors. Participants may come from all disciplines, enrolled at a university from the following towns: Innsbruck, Graz, Linz, Vienna or Salzburg. The participation does not require an own business idea, if one has one, he/she may bring it along. Otherwise, a business idea will be developed in the team.